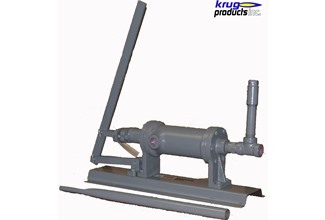 Krug Products offers a variety of products ranging from motor driven vapor compressors and hand pumps to torches. We create quality products that we know our customers will find confidence in. Krug Products vapor compressors are the premier product to ensure efficient transfer of Butane, Propane, and Anhydrous Ammonia. Using our LP powered vapor compressor is one of the most economical ways in which to transfer, evacuate, or purge tanks. Once the connections are made, it is a closed loop system with chance of leaks which makes it very environmentally friendly. Much like our LP powered compressor, this too is very economical and completely environmentally friendly. These compressors will save your truck pump from damages when evacuating tanks. Capacity for both the LP and gas powered compressors is anywhere from 19 to 55 gpm depending on the size of transfer piping that is being utilized. Available with Gasoline or LP Carburation. 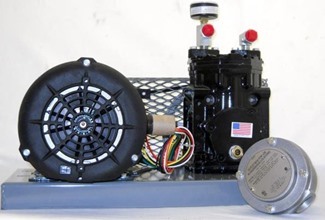 Our electric powered compressor is another option when choosing a compressor that fits your needs. This type of compressor can be run with very little worries of ventilation if utilizing the pump in-doors. The Krug Pump is a precision engineered instrument . It does not require skilled mechanics to install; easy to operate, and in most cases, the servicing required can be done by the purchaser themselves. However, for best results, and to add extra life to your pump, care should be exercised in both installing and servicing your pump. Here at Krug Products we have a variety of handheld torches that have multiple uses to help make your job a little bit easier. Flaming can help take care of weeds in your garden, concrete cracks, rock garden, driveways, and along fence lines. This also helps eliminate the need to use expensive and toxic spraying chemicals. Our torches also work great for burning heavy weeds, brush, stumps, and other debris. It is very efficient at burning off irrigation ditches, fields, and culverts. The heat from our torches can also be used to remove paint, grease, oil, plastic, and other residues from metal and concrete. They work well for heating metal castings, pipe and tubing, branding irons, pots, kettles, tar, asphalt, and roofing materials. Each torch is blister packed, complete, and ready to use. All torches have a safety shutoff and no regulator is needed. Blue Flame and Broom are packed 6 per box.